Learning your first programming language is hard. Learning your second programming language is a little easier. By your 5th programming language, it's a piece of cake. The reason is simple: once you know a single language, you know the core concepts of programming as a whole. Then, to learn a new language, all you have to do is learn a new syntax and review the nuances of the language. These days, online tutorials and videos are a dime a dozen. Learning materials that teach you programming are all over the place in every imaginable format. So it's easy to find resources to learn your first language. But what about your nth language? And what about a language you used to know, but haven't used in a few years? You don’t want to use a book or online tutorial, because you don’t want to have to be told what a "method" is, or what how to use "instance variables". You just want to familiarize yourself with the syntax. They key difference is that you want a refresher on the basics of the language, not the basics of programming. I think this is a common problem. 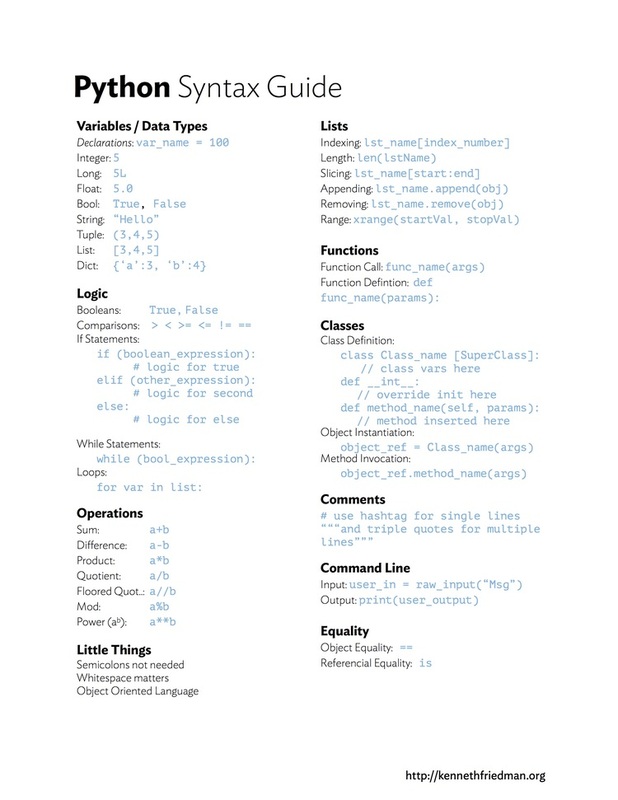 Many people know programming, but want a cheat sheet for a particular programming language. 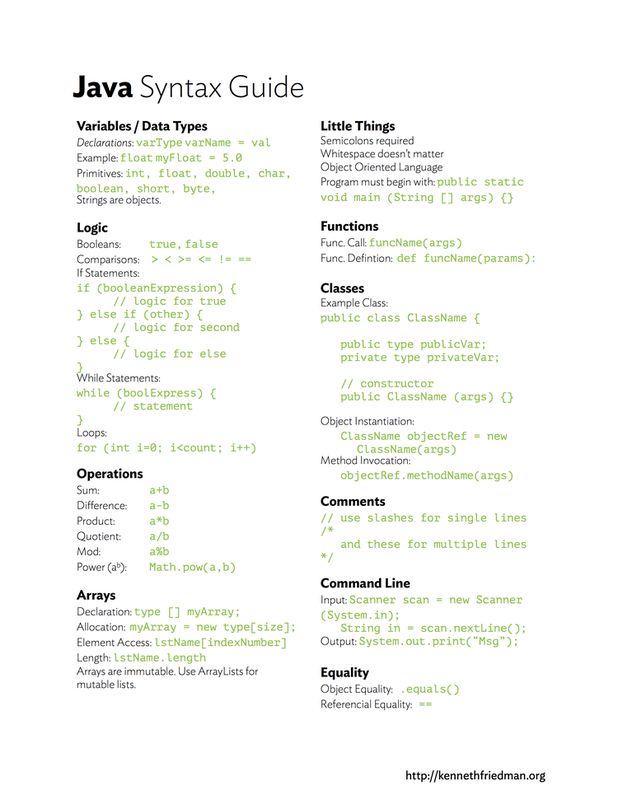 It would be great if there was a uniform syntax guide for programming languages. They would all have the same format, so each one would feel familiar. It would fit on a single page (printable, if you want). And it would be available for many languages, at least the top 20 or so most common. So here they are. Well, at least for Python and for Java. They are far from perfect (think of it as still a beta), but the general idea is there. What do you think? Would these be helpful? I’m assuming most people that know how to program know at least one of these two languages. So the syntax is already familiar. But what if you want to quickly dive into Ruby, or Swift, or Matlab. I think having these for every language would be a great reference. Do you?